An English Georgian style pedestal table with 10 Queen Anne dining chairs. The walnut-finished table measures 10-foot. The table includes two extending leaves of 24 inches each. Purchased from a dealer in Taplow, Buckinghamshire. A work of superior craftsmanship. The feature of cabriole legs with hand-carved motifs and back splat with a scrolling emblem makes the set distinctive. A lovely veneer is layered to the burr walnut wood. Available in a perfect condition. An English Victorian style 14-foot long dining table and a set of 10 Queen Anne chairs. Both table and chairs are in mahogany. Extends a feel of old tradition in England. Four leaves of 18 inches each and two D ends of 4 feet each are attached to the table for providing different sizing combinations. The chairs come in the combination of two arm chairs and eight side chairs. High backs of the chairs are carved in Queen Anne style. The chairs come with cabriole legs and designer motifs. A piece bought in Royal Tunbridge Wells, Kent. 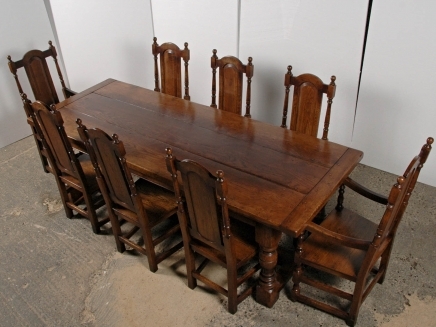 A spellbinding English Victorian style dining table with 8 Gothic Chippendale chairs. The dining table is 14-foot long. The sturdiness of the set would make this piece last for centuries. Features hand turned bulbous legs in balloon shape attached with castors. The wobble-free table stands stable with great balance. The table is finished in a deep mahogany finish. Ball and claw design on the feet of the chairs. Purchased from a dealer in Sheringham, the piece can be made available to anywhere in the world. Patina finish for a perfect antique look. Purchased from a dealer in Debenham, Suffolk. Table is finished in oak and are solidly constructed. The chair set comprises two arm chairs and six side chairs. Hand woven rush seats for the chairs. A perfect example of superior craftsmanship. 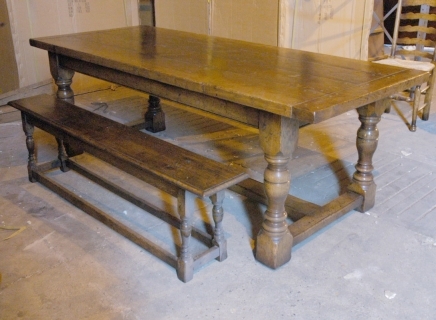 An English refectory table and bench set in oak. Looks antiqued with its rustic finish. Benches have a Monk style aura and are comfortable to sit on. Finest oak finishing is done on the table and the bench. The patina layer formed displays a classy feel. The wood has a grained finish. You may mail for further information. 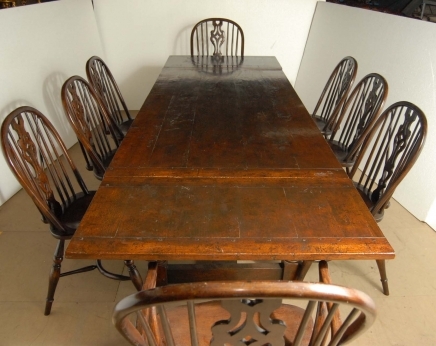 An English oak refectory table with 8 Gothic high back chairs. Exhibits a rustic, antique look. Ideal set for a farmhouse look. The chairs come with chunky legs. The dining set can seat 8 people very comfortably, with the large surface area. The table boasts of sturdiness. 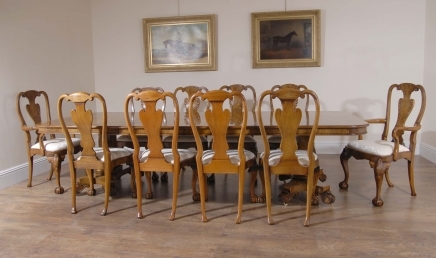 An elegant dining set of extending table and dining chairs. 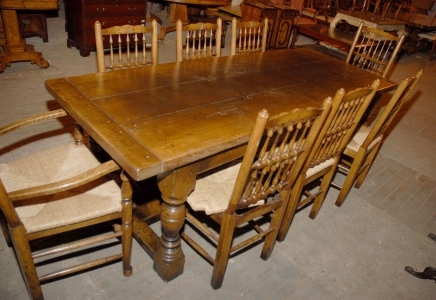 Comprises 10 Queen Anne style dining chairs and Victorian style extending dining table. The table measures around 14 feet and has Victorian style legs. Comes with leaves and an extending handle. The carved back splat of the chairs seems very stylish. The chairs are refinished for upholstery. 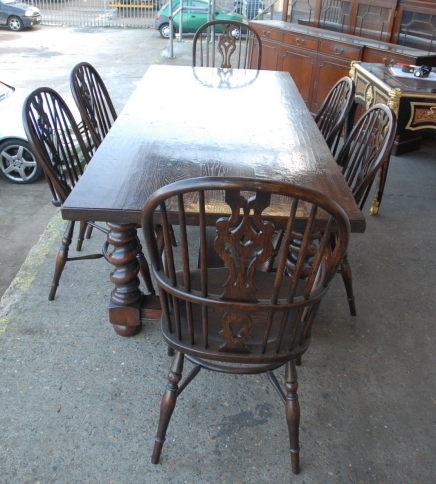 A set of 8 Windsor arm chairs with refectory table in oak finish. An ultimate addition to your home or kitchen dining area. Includes 2 arm chairs and 6 Windsor style side chairs. Capable to resist the day-to-day rigors. Features hand-turned legs that link the stretchers to the bottom. The apron to the table is embellished by hand-carved sections. The set is offered in a very good condition. Purchased from a dealer in Sheringham, Norfolk. 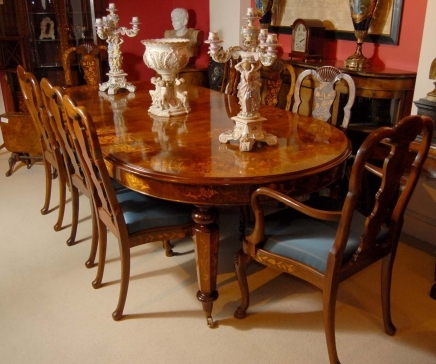 The intricate and exclusive 8 foot Italian Marquetry dinning table with 8 Queen Anne Chairs. 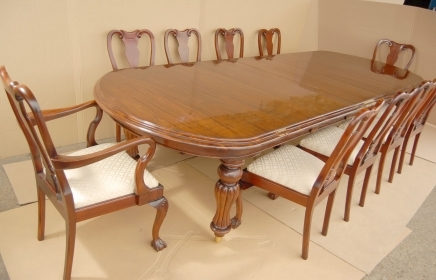 The inlay work is beautiful and the table comes with the set of matching 8 chairs. The inlay work has been done on all surfaces of the table. It main feature of the table is the patterns and designs used for the inlay such as flowers, vines, scrolls and leaves. Immaculate skill and craftsmanship involved in creating such a piece of furniture. It offers the users a royal kingship look and is crafted from walnut. It is a sturdy, robust and resilient piece of furniture. This table is durable and will last you for a lifetime. The table can be shipped to any place of the globe.